Baseball season began in the US recently and in their preseason they often have what they call “split squad” games which are exactly what it says on the tin...for example the Yankees could be playing both the Red Sox and Giants in different locations on the same day by using everyone on their roster. 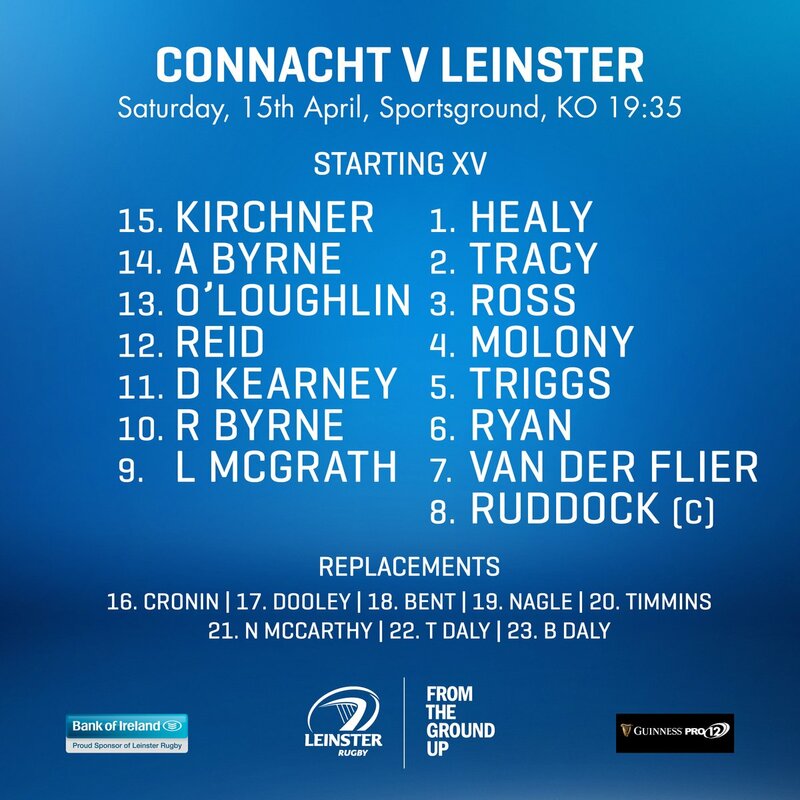 It looks like Leinster have taken a page from this playbook for these two matches between our European quarterfinal and semifinal - I know we often rotate our squad, but this kind of chopping and changing is on a different level altogether and while the individual players are well capable of performing, it also presents difficulties in key combinations around the park. Another concept I’m borrowing from America’s national pastime for my preview this week is that of a “magic number”. Towards the end of a regular season when a team looks like reaching the playoffs, the local press calculate a number and every time they win, or their nearest rivals lose, it goes down by one until it reaches zero and they can’t be caught. What Leinster want in the Pro12 more than anything else is a home semifinal. First place for a second year in a row would be nice, but with the final in the Aviva Stadium I wouldn’t be so concerned if we finished second, even behind our friends down the N7. So having fed all the info into our supercomputer here at Harpin Manor, it seems our own magic number for a top two finish is six. This means we need six points from our last three encounters and that number gets even smaller when the Ospreys fall short of the five points from their matches. “Those Pesky Birds” have a derby match of their own as they face Cardiff in “Judgment Day” - a maximum haul will be hard to come by as the Blues have been playing good rugby of late. 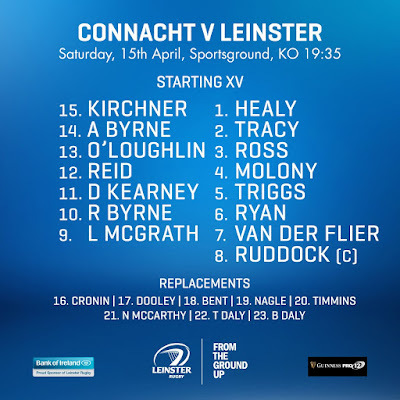 As for our chances in Galway, well, the reigning champions may have found things much more difficult this season and a rake of injuries plus the “lame duck” nature of Pat Lam’s tenure can’t have helped. But you know as well as I do...they won’t need to be worrying about any of that when it’s Leinster’s team bus arriving at The Sportsground. They’ll be well pumped to be the first team to beat us in 2017. What an amazing stat for their skipper John Muldoon to reach 300 appearances, he’s a true warrior. That said, I fancy our pack to have the edge and their biggest hope of success should come from their backline where they have plenty of ways to make the most of any defensive frailties on our part. For this reason I think our centre pairing of Noel Reid and Rory O’Loughlin could be key. If we can keep the line breaks to a minimum, which this pairing are well able to do I might add, then it could serve to frustrate the home side early. As for our points scoring, it is in the hands of Ross Byrne, hero (though nearly villain) of the hour in Swansea. My advice to him would be to trust his boot...it has served him well in a Leinster jersey and once he can tame the trademark Galway gales, he can do much to keep the home side on the back foot. Bookies make this too close to call, shading their points spread in Connacht's favour by one. I know we can win this one, but I can’t help feeling our good fortune in recent Pro12 matches is due to run out so I going to go for a home win by 3-5 points, thus knocking one off of our “magic number”. If we come out of the weekend needing just one win of any sort from our final two matches to clinch a home semi, I’ll be happy.